Early Blight (Alternaria solani) is the scourge of tomatoes in a wet spring. This fungus begins on the lower leaves as yellow spots that rapidly turn brown. In a few days, the entire leaf begins to yellow. Turn over the leaves and you’ll find brown patches of fungal growth. The carnage doesn’t end here as the fruit will likely develop leathery lesions caused by the same disease organism. None of these symptoms are acceptable in the tomato patch. An Early Blight attack is almost like wildfire—by the time you’ve lost the lower leaves, the top ones are already starting to turn yellow. Suddenly your BLT (bacon, lettuce and tomato sandwich) forecast is looking pretty dismal since tomato plants seem to produce more and better tomatoes with a full set of leaves. Actually it’s not a bad idea to remove the lower 12 inches of leaves by the time the plants are knee high, especially when rains are frequent. This is where the disease gets started from spores splashed up from the soil. The improved air circulation will also help to dry the remaining leaves before the cooler temperatures during the night that favor disease development. 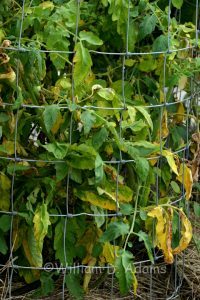 It seems reasonable to expect that hybrid tomato varieties might be more resistant to the fungus, but in this year’s garden, Celebrity, Better Boy and Big Beef seem to be the most infected while some old varieties like Cherokee Purple and San Marzano have fewer infected leaves. It could just be coincidence since this doesn’t qualify as a scientific observation, just a testimonial. All varieties have some yellow leaves and I’ve sprayed with chlorothalonil (Daconil) twice. I’ve also removed a lot of infected leaves and gotten them out of the garden. They’re a source for clouds of spores when the rains and humidity persist. Once the yellow leaves are removed, it’s time to spray with a fungicide. If you’re striving for organic tomatoes, you will be limited to sprays like Serenade (Bacillus subtillis), wettable sulfur, or one of the copper sprays like copper sulfate or copper soap sulfate. Copper sprays like copper hydroxide (fixed coppers) weren’t recommended in the organic schedules though they may be more effective. In a very aggressive spray schedule from North Carolina State University, several spray ingredients are combined and sprayed over a fifteen week period. The first few pages of my internet search turned up primarily home remedies and organic sprays which I presume mirrors the interests of most home gardeners. The university disease control recommendations began about page three in the search and were more for commercial growers. Some of the pesticides recommended I’d never heard of and they may be restricted to applicators with a commercial license. Mancozeb, Zineb and Chlorothalonil are generally available to the home gardener. Endura, Ranman, Presidio, Revus, Cabrio and others sound more like commercial sprays. Regardless of the spray program you elect to use, it is important that you’re sure to spray the underside of the leaves as well as the top. Hose-on sprayers are generally difficult to use this way, so the best coverage is effected using a pressurized sprayer with a nozzle that can be directed upward to catch the underside of the leaves. Home gardeners will find that a one or two gallon pump-up sprayer is about all they want to handle. Backpack sprayers are great for the large garden, but three gallons of spray is a heavy load to strap to your shoulders. If possible, try not to wet the foliage in the evening since the disease will be more active during overnight temperatures. Better yet, don’t wet it at all with sprinkler irrigation—use drip or micro-sprayers close to the soil. The roots will get the water and the foliage will remain relatively dry. William D. (Bill) Adams is the author of numerous articles and his photos have been published in a number of magazines, calendars and books. He is the co-author/photographer of “Commonsense Vegetable Gardening for the South” with Tom LeRoy and he is the co-author of “The Lone Star Gardener’s Book of Lists” with Lois Trigg Chaplin. Bill and Tom also teamed up for another book—THE SOUTHERN KITCHEN GARDEN. Most recently Bill authored THE TEXAS TOMATO LOVER’S HANDBOOK a guide to growing the most delicious tomatoes on the planet. This latest book published by Texas A & M University Press. Bill worked in mass media most of his career appearing on radio and TV programs, and writing a weekly column. Adams also served as the Harris County Master Gardener Coordinator with over seven hundred active members. These days, after retiring from the Extension Service, Bill is concentrating his energies on gardening, writing and photography. He is a much-requested speaker at Garden and Civic Clubs and he is a regular contributor of articles and photography to Neil Sperry’s Gardens magazine. Bill has been a member of Garden Writers Assn. since 1972 and has served several terms as a Southern regional director.